This blank invitation card which mounts on our A7 Base Cards (A7 Signature, Retangolo, Vertico, 5x7 Panel Card, Panel Pocket A7, and Petal Fold A7) are intended to be printed at home on an inkjet printer. Our White & Cream card stock works with most inkjet & laser printers. The Snow White & Cream Puff are a heavier weight, 100lb and we recommend ordering a sample to make sure your printer can print on 100lb weight. Uses: Do-It-Yourself printing invitation card. I'll be getting married in 6 months and have been researching the cost of ordering invitations vs. printing at home. After extensive research, I settled on doing them myself at home. 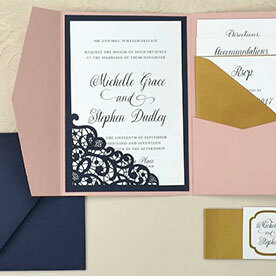 C&P offered the BEST PRICES & QUALITY for invitation pockets, blank invites and inserts. Had I order the invitations that I decided on, I would have spent well over $300; with C&P, all items totaled $150...and that included my envelopes. I will never order from anyone else! I'm using these blank invitations as RSVP and reception information cards. They are perfect sized! I had my wedding invitations professional printed but had to change the location of my wedding and didn't want to pay full amount to reprint all the inserts! These worked out great for the price. I just printing them at home and saving the money!! I place 90% my paper and pocket fold orders from C&P because I love how fast I get my orders -sometimes the next day. I love this and all their products. Just wish the pre-cut invitation paper was offered in more colors than white and cream. 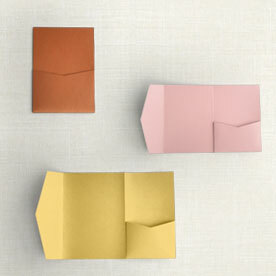 Also wish you had pre-cut linen invitation paper, pocket folds, enclosure paper & envelopes. PLEASE STOCK LINEN.